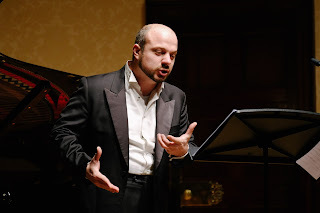 The Italian bass Gianluca Buratto has sung in London before (he was in the cast of John Eliot Gardiner's performance of Monteverdi's L'Orfeo at the 2015 Proms), but Buratto's Rosenblatt Recital at the Wigmore Hall on Tuesday 12 January 2016 was his first recital in London. Accompanied by pianist James Baillieu, Buratto sang a programme of mainly operatic arias from Monteverdi's L'Incoronatione di Poppea, Handel's Orlando, Vivaldi's Tito Manlio, Mozart's Don Giovanni and Die Zauberflote, Rossini's Il barbiere di Sivigla, Bellini's I Puritani and Verdi's Simon Boccanegra, plus Maurizio Cazzati's cantata In Calvaria rupe moribundus. It was, perhaps, a mistake to begin with Seneca's long death scene from Monteverdi's L'Incoronatione di Poppea. Not that Buratto didn't have the voice for it, he certainly did. From his first notes he revealed a wonderfully sonorous and rich bass voice with a lovely sense of line and legato and an enviable ease at both ends of his range. But his stage presence was so discreet, so unassuming that the scene just did not make the impact that it should have. 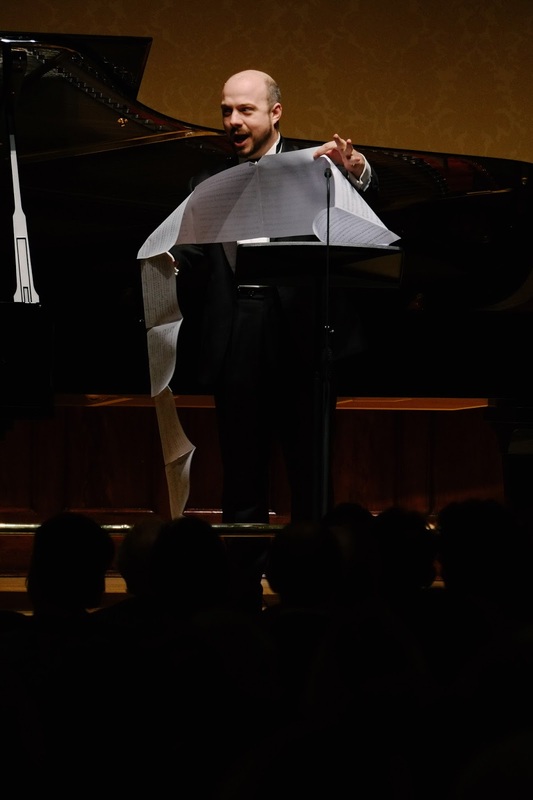 You felt that at times Buratto was using the music stand to shield himself from the audience, rather than bringing Monteverdi's flexible recitative to dramatic life. Add to this the omission of the chorus parts for Seneca's followers (played on the piano), and you had a piece where the drama did not quite happen. This was a shame because Buratto's voice seemed perfect for the role; he captured the sombre dignity of the part and really brought out the words. Perhaps he simply needs a good director. Next came the cantata In Calvaria rupe moribundus by the 17th century Italian composer Maurizio Cazzati. This was a long fluid recitative followed by a quite discreet aria. For Zoroastro's aria Sorge infausta una procella from Handel's Orlando, Buratto started to reveal a bit of bravura temperament, and projected a bit more emotion from the stage. He had an enviable control of the virtuoso elements of the aria, with firmly resonant tone, good passagework and a fine sense of drama. If we don't hear him in a Handel role in London soon then we are seriously missing out. The final item in the first half was in a similar vein, Tito Manlio's aria Se il cor guerriero from Vivaldi's opera Tito Manlio. This was Vivaldi in instrumental mode, with the voice being given long instrumental-like passagework which Buratto despatched with facility and vivid energy. After the interval Buratto seemed to have relaxed enough to demonstrate real personality, and become positively demonstrative in his performance. His account of Leporello's aria Madamina, il catalogo e questo from Mozart's Don Giovanni was genuinely funny as well as being well sung. Buratto relished every outrageous word of Lorenzo Da Ponte's catalogue, whilst his warm bass voice moved with admirable ease in its top range . When, towards the end, Buratto turned his music into the catalogue which cascaded all over the music stand, the effect was masterly. We had a different sense entirely in Sarastro's aria O Isis und Osiris from Mozart's Die Zaubertflote. Here Buratto brought solid dignity to the aria, creating a real sense of dark strength in the voice and producing some wonderful low notes, rendered all the more admirable by being part of the melodic line and not produced in isolation. Anyone who can sing Sarastro's aria without the voice gradually fading out as the part goes lower has to be loved forever, but combined with Leperello's aria it showed the astonishing range of Buratto's technique. We were back to comedy with a highly characterful account La calunnia from Rossini's Il barbiere di Siviglia and after hearing Buratto's brilliantly controlled crescendo of comic effects in the piece, I rather regretted that he wasn't giving us more comedy. Things took a serious turn with Giorgio aria Cinta di fiori from Bellini's I Puratani sung with a lovely sense of melancholy dignity and a great feel for the bel canto phrases. The aria was full of evenly shaped lines with barely a bulge anywhere, and all was expressive. The final aria in the programme was Simon Boccanegra's Il lacerato spirito from Verdi's opera Simon Boccanegra. This a sombre, melancholy piece and Buratto did it full justice, though it seemed a trifle strange as the end of a recital and one hoped that we would be treated to something showy in the encores. The first encore was something of a surprise. James Baillieu launched into a slow-ish and somewhat lugubrious account of the introduction to Ombra mai fu from Handel's Serse and my heart sank. This is an alto aria and I had visions it being transposed down an octave or more. Not a bit, Buratto sang it at pitch in a very creditable counter-tenor voice. Granted the style was quite romantic, but as an encore it was very striking. Buratto and Baillieu followed this with a final encore, a highly emotional and very demonstrative account of Tosti's Ideale. Throughout, James Baillieu was a wonderfully supportive accompanist. Granted the early baroque pieces sounded somewhat strange on the piano, but Baillieu brought a nice sense of style to them. 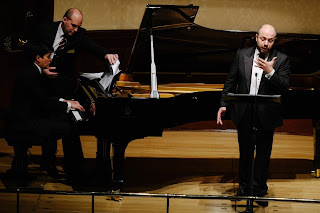 This was a relatively short concert, and there were many good things in it, but for much of the first half we were aware of the way Buratto seemed not to be relaxed and I did wonder how much rehearsal time he had been able to get with James Baillieu. But as the evening wore on, Buratto seemed to relax and come out from behind his music stand (both physically and metaphorically). 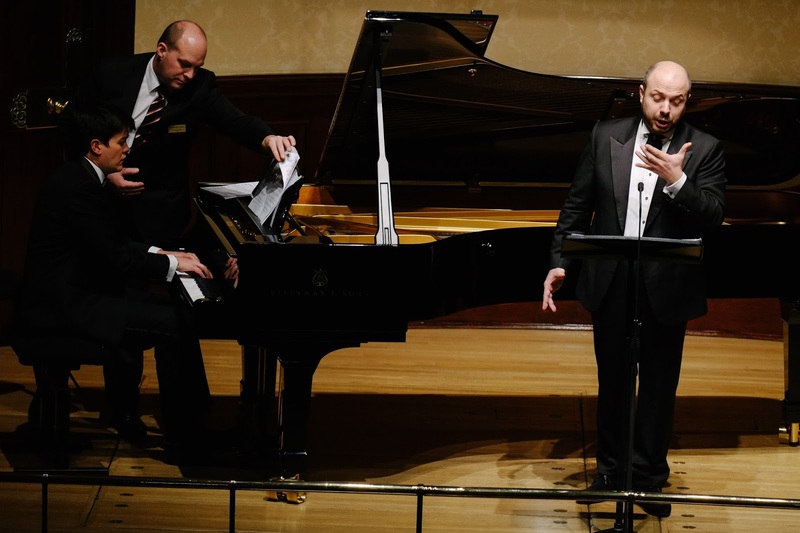 I certainly hope that Rosenblatt ask him back, in the hope that he realises quite how enthusiastic Rosenblatt audiences can be when presented with such a lovely voice sung with such a sense of style in both comedy and bel canto.